February is Heart Health Month and a great time to refocus on one of the most important things we can do for ourselves – keeping our hearts as healthy as possible. Fortunately, when it comes to heart health, diet plays a major role, which is indeed good news, because it means that we actually have control over our heart’s health. Generally, a heart-healthy diet is a diet that helps you lose weight, and lower your “bad” cholesterol, triglycerides and blood pressure. Regardless of specific foods, try to always choose whole, natural foods and avoid processed foods as much as you can. Processed foods often contain trans fats, which are extremely damaging to the heart; they also often contain cheap, potentially rancid vegetable oils, too much sugar, too much salt, and preservatives. None of that is good news for your heart, and being so palatable, these foods are also more likely to cause you to overeat. Our advice? Don’t keep them in the house, and you won’t be tempted. 1. Wild-caught cold water fish. Whether it’s salmon, herring or sardines, cold-water fish contain omega-3 fatty acids. Research has shown that omega-3 fatty acids decrease risk of abnormal heartbeats, decrease triglyceride levels, slow growth rate of plaque, and lower blood pressure. Remember that due to mercury content found in fish, they should be eaten in moderation. 2. Dairy. For years, we’ve been told that saturated fats are unhealthy. But newer research shows that dairy fat can reduce the risk of heart attack. Dairy foods, such as Greek yogurt (LINK to Voskos homepage) contain a number of potentially beneficial substances, such as calcium, vitamin D, and potassium, noted the researchers. They have also been shown to increase people’s levels of “good” HDL cholesterol. 3. Nuts, especially almonds and walnuts. These contain plant-based omega-3 fatty acids, as well as vitamin E, magnesium and folate. A handful is all it takes – nuts are very calorie-dense, but a small amount will keep you satiated for a long time, thanks to their healthy fat content. 4. Red wine. We’ve all heard about the French Paradox, and it seems to be at least partly explained by the French high consumption of red wine. Red wine contains flavonoids, which can improve “good” HDL cholesterol. Obviously, you don’t want to overdo it with wine – a 5oz glass with dinner each night is just right. 5. Berries, especially blueberries. 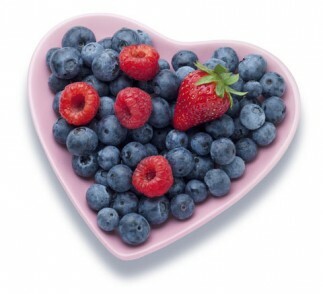 Berries are loaded with potent antioxidants, folate, calcium, magnesium, potassium and fiber. How wonderful it is that these tasty little treats are also so very heart healthy! The list above highlights just a few of the heart-healthy foods that we should all incorporate into our diets. There are many more (fresh vegetables, for example! ), but the above list, and staying away from junk foods, is a good place to start.